The supply chain software market is changing all the time. For manufacturers, wholesalers, retailers and logistics service providers who are looking for a suitable solution, it remains difficult to make true comparisons between software vendors. Therefore, in 2009, Supply Chain Media launched the “IT Subway Map” to provide a clear, at-a-glance overview of the vendors who are specialised in the various types of supply chain software (ERP, WMS, TMS, etc.). The SCM editorial team designs the map independently, based on the number of implementations and revenue percentage per software solution (including required threshold levels), company size and positioning with respect to competitors. In order to be included on the European edition of the SCM IT Subway Map, vendors must have their own offices in several European countries. Interview with the director of the software vendor about the company’s history, evolution and vision (3-4 pages). Interview feature with a supply chain professional from one of the company’s leading software customers (=users) in Europe (3-4 pages). Combination of both interviews in a separate special edition including the recognisable SCM cover additionally featuring the customer’s and vendor’s logos and with the vendor’s advertisement on the outside back cover (8-12 pages, print run of 500 copies). Publication of the interview feature as an editorial article in Supply Chain Magazine (NL) and/or Supply Chain Movement (Europe) depending on the type of customer. Digital publication of the special edition in the SCM app for iPads and Android tablets (>10,000 users worldwide). Movement (Europe) website(s) for generation of leads including contact details. 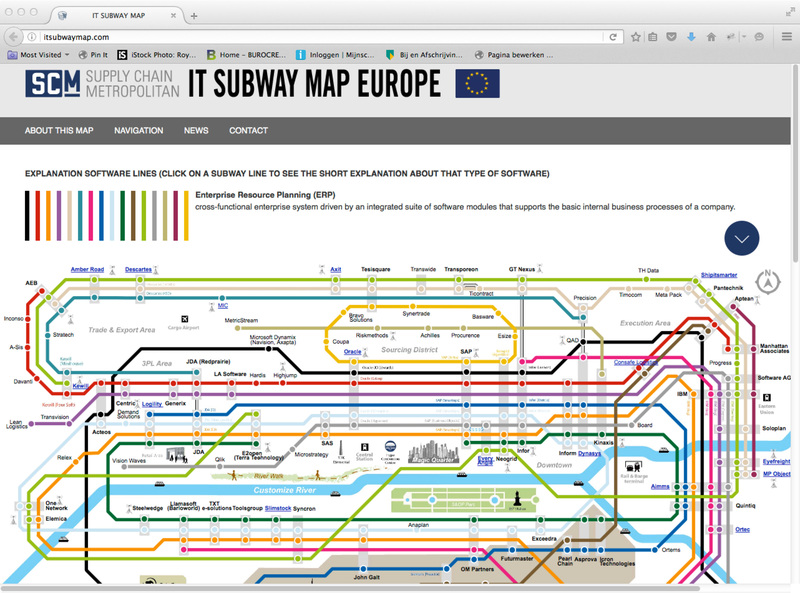 Online publication of the vendor profile and customer case on www.ITsubwaymap.com. Release of abovementioned content for company’s own use, including in other media channels.